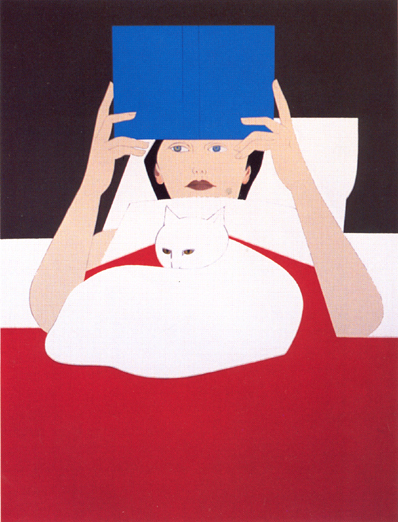 Will Barnet was a key figure in an American movement called Indian space painting. These painters based their semi abstract works in the art of the Native American. As the artist portrays his relatives and pets in his pictures, many say that Barnet “makes us experience the universal from the personal”. In Woman reading, we see a female laying in bed reading a blue book next to her white cat. Barnet uses huge flat color fields at the same time he simplifies the shapes and details. Thus, he abstracts the motif and, although I don’t like the painting, I consider it effective. ~ by Álvaro Mazzino on March 11, 2011. So this is where Alex Katz is coming from.?! my brother bought me this framed print at a garage sale .I had no idea who barnet was until recently. The Microsoft promotion challenges people to get XiaoIce to say certain phases, should they get lucky, they would stand a chance to win an iPhone 6, 6 Plus, 5S, 5, or 5C. This entry was posted on March 11, 2011 at 10:22 and is filed under Pop art.You can follow any responses to this entry through the RSS 2.0 feed.You can leave a response, or trackback from your own site.